Chopper Fans,High-VelocityLow-Speed Fans are specially designed with clean energy in mind. Our engineers thought of a fan that produces maximum air using low energy and can serve for a long cycle of single use. We’ve employed the best of technology and engineering at arriving at an industrial fan with low noise level and minimizes the cost of installation. Unlike many other industrial grade fans which consume massive energy, Chopper Fans strength is maximum airflow with the lowest energy possible. Whether during winter or summer, Chopper Fans are fortified to serve all year round. When you think of Chopper Fans, what should come to mind is that it doesn’t just function as a coolant system, by also destratify the air. With Chopper Fans in place, expect an increase in productivity, with a remarkably low energy bills. Overall, creating a comfortable working atmosphere. Most industrial settings are already filled with noise generated by heavy machinery. It can be deafening having an industrial fan adding to the noise. With Chopper Fan, you’ll experience a quiet and seamless operation. From the ceiling to the floor and walls to walls, Chopper Fan ensures the temperature is evenly distributed. Hot and cold air is well circulated throughout the entire building. The floor and the walls will receive a good amount of air and keep the environment regulated. Controlling Chopper Fans doesn’t need technical expertise. Anyone can easily maneuver the speed selection to suit all seasons and time. If you have a computerized HVAC control system in place, it can be interconnected for automatic functioning. Installing Chopper Fans is cost-efficient, so also is the payback period. When compared to the ROI, Chopper Fan maintenance is close to zero. When used with commercial air conditioning system, it lowers the energy costs. 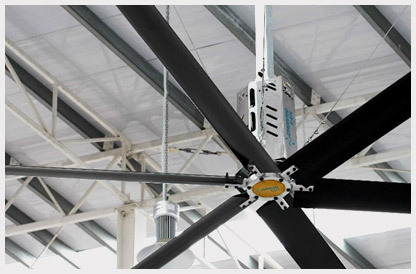 Chopper Fan can either work as a stand-alone systemand works as a complement to other cooling systems. Either way, the result is amazing as it will drastically cut low the utility bills. For more information visit the website www.chopperfans.in, or fill the form below for us to contact you back.